Savvy cooks don't have to skip out on cookies and other indulgent treats while trying to protect their heart health or their waistlines. You can learn tricks to transform recipes with gobs of butter into snacks with significantly less fat and more fiber, vitamins and minerals. These tips aren't just for the health- or weight-conscious. Any time you're in the mood to bake but short on butter, you can use a substitute. Margarine tastes similar to butter and contains fat like butter, but it may offer you some health advantages when you use it your baking. It is made from plant sources, not animal sources, which means true margarine has more heart-healthy unsaturated fat and no cholesterol. You can replace all of the butter in your baking with margarine, or just replace some. Make sure to read the label carefully because not all stick or tub butter substitutes are real margarine. Look for the word "margarine" instead of "butter substitute" or "vegetable oil spread." Avoid those listing hydrogenated oils in the ingredients, as these types of margarine contain unhealthy trans fats. Fruit purees provide bulk and flavor in place of butter. Applesauce, mashed bananas, pureed dates, prunes or figs are just a few examples of nutritious, fibrous and low-fat butter substitutes. To retain the true texture and preserve the flavor of your cookie, it's best to replace just half of the butter with pureed fruit. 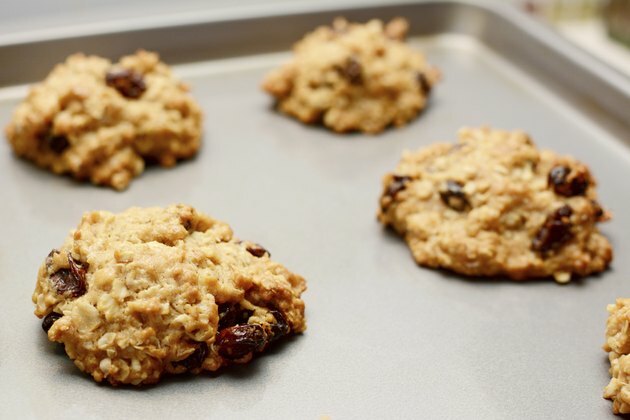 Fats help create part of the chemical reaction that makes cookies their best. Experiment with a fat-to-puree ratio to find the balance that gives you the best taste and texture while still reducing the overall fat content. The fat component of butter is really all you need to provide the chemical reactions that take place in your baked goods; the buttery flavor just adds a tasty bonus. You can substitute equal amounts of liquid cooking oils for butter in most cookie recipes or use virgin coconut oil. If the recipe calls for salted butter, you may want to add 1/2 teaspoon of salt per cup of butter, and when using oils you should substitute 7/8 cup for each cup of butter. Skip fat-free or low-fat margarine or butter substitutes, because these products don't hold up the same as other fats, don't hold their bulk like fruit purees and will likely destroy your cookie's texture. Skip shortening unless it says on the label that it's made specifically for baking because regular shortening creates flat, dense cookies. Can Pregnant Women Eat Unsalted Butter?